We chatted about the latest album, the band’s new guitar player, the tribute to Lemmy, the likelihood of some kind of “best of” album, a future live album and more. 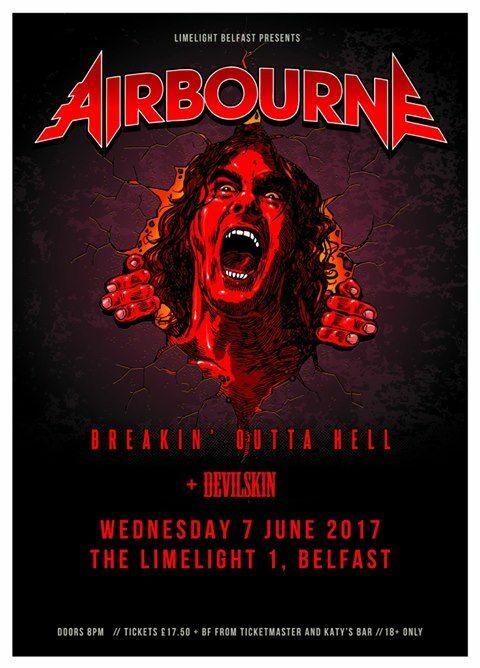 Also on the Show is an interview with New Zealand band Devilskin who were supporting Airbourne. The interview with Ryan has been transcribed and posted below. 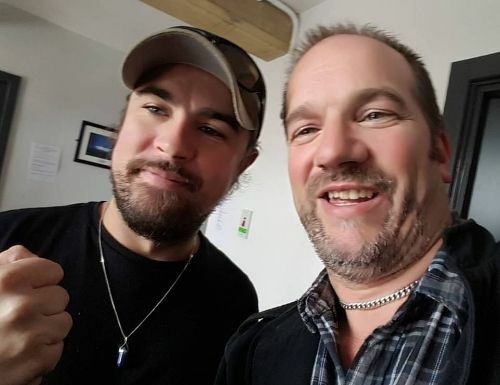 NI ROCKS – Hi Ryan, thanks for taking some time to talk to Rock Radio NI. This is at least your seventh time playing Belfast . Hopefully you keep coming back because you like us rather it being us making you come back? Or maybe it’s for the Guinness? NI ROCKS – You played in Dublin last night and you move on to Edinburgh on Friday before playing at Download. That’s the first of many festivals you’re playing in Europe during June and July, but as far as I can see no more smaller venues until you return to Europe again in October. I like to think that makes us special! Do we get to warm you up? Why play a few small shows? RYAN – I don’t know. I guess that’s a question for the agent, they’ve always got a plan in place. But we do love coming here a lot. We’ve actually spent time here off the road, just on promo trips at White’s Tavern and stuff like that. Having a few Guinness and it’s always like coming home. It’s a lot more fun to come in summer when the sun is out and the weather is good and that’s always a bonus. NI ROCKS – On a more serious note, following events in Paris in 2015 and in Manchester last month, with you playing so many festivals across Europe, is security something that worries you at all or do you just try to get on with things as normal? RYAN – Ah no, I’m pretty sure the powers that be have made a judgement given the current situation. Live Nation are a pretty large company and I’m sure the people at the top will be doing what they need to do. NI ROCKS – You’ve had a change in the line-up since the last time you were here. Harri Harrison recently replaced David Roads on guitar. I believe David has gone to work in his family business. How did you pick Harri as his replacement? RYAN – We’ve known Harri for a very long time – years back. He toured with us in his own band a couple of times. We’ve basically been drinking with him every weekend since. It was one of those transitions that really just made sense. Roadsy wanted to go back to work with his dad which was understandable and we’re wrapped to have our best mate finally in the band and doing this. NI ROCKS – The video for your latest single “It’s All For Rock n Roll” was a tribute to the late, great Lemmy. It featured the Bomber lighting rig. Where did the idea for using that iconic rig come from and how easy was it to get things organised. RYAN – It was one of those things that was actually surprising. It was the same kind of situation as when we got Lemmy to drive the truck in “Runnin Wild”. Initially we were thinking we’ll get someone who looks like Lemmy and someone said why don’t you just ask him. The same thing; I think one of us said on the bus, how great would it be if we had the bomber and I’m pretty sure Mark, our TM just e-mailed the crew over there. They said absolutely, we’ll send over a couple of guys to operate it for you and we were honoured. NI ROCKS – We’ll play a track from the latest album now. We’ll maybe start with “It’s All For Rock n Roll”. Tell us a little bit about that track. RYAN – Obviously it’s written about Lemmy. I guess the lyrics could relate to a lot of guys past, but Lemmy was definitely the influence to the lyrics of the song. It was one of the last tracks that was recorded on the record. Joel and I were in an Air BnB or whatever trying to figure out the lyrics for that last riff which we had kicking around for a while and thought we should write about Lemmy. It came together really well and we shot the film clip not long ago. NI ROCKS – The band’s fourth full studio album “Breakin Outta Hell” was released last September just after your last gig in Belfast in August. That was the first album with Spinefarm. Where was it recorded and who had you worked with? RYAN – We recorded it in Melbourne at Sing Sing Studios, which I don’t think is there anymore unfortunately. It was one of the last real studios in Australia to be able to do a record the way we do it – old school with the band in the room vibe (Note – the famous studio in Cremorne had to close, but the South Yarra studio remains open). We had Bob Marlette fly out with Mike Fraser who engineered it. Bob produced it and had done “Runnin Wild” with us. Mike had engineered the last four or five AC/DC records, along with Metallica and Aerosmith. So we had a five star team in there and worked away for about three months. They stayed out in Australia and we had a lot of fun doing it. Actually, I look forward to working with those guys again hopefully if we can. We cut to tape in the old way which cost us a lot, but anyway! It was good fun. NI ROCKS – Which brings us onto the next question. So far the band has been putting out an album every 3 years – the first EP was 2004 then we had albums in 2007, 2010, 2013 and 2016. Does that mean the next studio album is 2019 or are there plans before that? RYAN – Well, we’ve already started working on new material. It is weird that it just keeps slotting in that way. I guess because we do so much touring. We visit a lot more countries than you would have 30 years ago. We have begun working on this and I know one of the things as soon as we get back to Australia is to make sure we have somewhere to hunker down to start working. Half the time we spend trying to find somewhere to play, with people complaining or whatever. Hopefully it will come out a little earlier, but we’re definitely working on it. It will obviously be when it’ll be, but we’ll be doing our best to get it out promptly; as long as its good. NI ROCKS – What about a live album? Has there been any thought to putting out a live album / DVD? The last one was ten years ago now. RYAN – Yeah, there has been talk about it. I’m not exactly sure where that conversation has ended up. There’s a ‘Diamond Cuts’ thing coming out soon I think; which is a special edition thing. As far as live goes, we’ll be catching up with the Spinefarm guys soon and I guess that is something we can have a chat about. NI ROCKS – In terms of writing tracks, is that something that you’re doing all the time or do you set time aside when an album is due? RYAN – A bit of both. You’ll throw ideas down on the iPhone or whatever as much as you can. Generally you’ll just put down an idea; something that you can semi-visualise what it’s going to be. Then once you get into the crux of recording and whatever, then you’ll get into a room and make it into an actual real thing. There are always riffs and lyrics and stuff being put down to be reanalysed in the studio. NI ROCKS – Is there a standard formula for song-writing or do they all come together in different ways? RYAN – All different ways. There is no formula really. It’s just hard work and commitment. Just keep believing you will get to the end; even though sometimes when you’re in the studio it feels like there is no light at the end of the tunnel. You’re always trying to raise the bar on your previous work and that is a hard thing too, but you’ve just got to believe in yourself and keep going forward. NI ROCKS – Joel has a well earned reputation for climbing up rigging and for going walkabout during gigs. When he arrives at a gig does he suss out what he is going to do, or is it spur of the moment? Do you know what he is going to get up to? RYAN – He did it at Rock Am Ring. He climbed and none of us knew he was going to do it. It just depends on what he wants to do. He doesn’t necessarily tell anybody. Touch wood. It always goes ok! NI ROCKS – We’ll play another track from the latest album now. Can you pick a track and tell us something about it? RYAN – Let’s go with “I’m Going To Hell For This”. It’s just a crackin song really. It’s one that I think we’re going to try to bring out at the end of the year. We’ve only really played it once, but it’s a really good song and hopefully it’ll see its way into the set really soon. NI ROCKS – You’re on the road around Europe for the next couple of months. Do you listen to a lot of music when you’re travelling and what do you listen to? RYAN – It’s all pretty random really. Joel usually takes over the PA Aux and throws on a bit of AC/DC or whatever. It’s just random. It could be Jimmy Barnes or Status Quo. It just depends who has the iPod what comes on. NI ROCKS – Any young bands out there that you’d recommend people to check out? RYAN – I used to say Harri’s band Palace of the King, but he’s in the band now. There’s a couple of bands in Australia – Desecrator (who’ll be joining Airbourne for the European tour in October) , The Ugly Kings, Dead City Ruins to name a few. NI ROCKS – At this point what I thought we’d do is have a look back at the bands’ 4 main studio albums and talk about them. “Runnin Wild” – your breakthrough album from 2007. What’s your favourite track to play live and is there a track that you think might benefit from being re-recorded now? Not that I’m suggesting that any sound bad of course! RYAN – Definitely playing “Runnin Wild”. That song, every night I think we pretty much always finish the set with it and it’s just a great way to cap off a great set. Re-record? Hmmm! I don’t think I’d re-record anything as they wouldn’t really change. NI ROCKS – “No Guts, No Glory” – the second album from 2010. The same question - Favourite track to play live and any track that you’d want to change? RYAN - Probably off that one it would be “Raise The Flag”. Weirdly, if I was to change one thing I’d put “Raise The Flag” as the first song. That’s about it really. NI ROCKS – “Black Dog Barking” from 2013. A different question. Which track took the most time to get right and how did you make the decision on which 10 tracks go on the album and which 3 appear as bonus tracks on the deluxe edition? RYAN – On that one, maybe “Black Dog Barking” or “No One Fits Me (Better Than You)”. I think the bonus edition was actually recorded afterwards and the songs probably didn’t exist. That album was just made – we basically went in there with a bunch of demos and just made it song by song. The 10 or 11songs or whatever we did there – that was it. Then we got back to Australia and as usual had a bit of fun. NI ROCKS – And the most recent album – “Breakin Outta Hell” – released last year. Is there going to be another release of that album with more tracks? RYAN – Probably just the one release, other than a special edition thing coming out which isn’t actually connected. It’s actually just a look over the past few albums. (The boxset “Diamond Cuts” is released 29th Sept and features the first three studio albums, a B-sides album and a DVD). But that’ll just be the one release – I don’t think there are any new songs to put out. NI ROCKS – From that album, which is your favourite to perform live? RYAN – Probably “Breakin Outta Hell”. “It’s All For Rock nRoll” is also special – you’re not just playing a song. NI ROCKS - Will there be another single from the album? RYAN – I don’t know if “It’s All For Rock n Roll” will be the last single. It’s probably something we’ll chat with the Spinefarm people about when we get talking to them. Maybe! NI ROCKS – That’s all the questions that I have. Thanks for taking the time to chat with me. We’ll finish with another track from “Breakin Outta Hell”. Which one should we play and why? RYAN – We haven’t played “Breakin Outta Hell” yet, we’ll play that.